As 2008 began, my friends, family, and I tried to plan out our lists of events. Making such planning more complicated was the fact that I would be turning 40 in 2008, and there were still a few items remaining on my “before 40″ list. Among the most notable un-checked items was “qualify for the Boston Marathon.” Although I’ve run a number of marathons for fun, on basic training, I have never raced one. So, in early 2008, we started thinking about a fall marathon. The folks in Boston say that someone my age must complete a qualifying marathon at or below 3:20:59. My two fastest previous marathons were 3:23 and 3:26, so it seemed doable. The multitude of online calculators say that someone with my 5k, 10k, and half marathon finishes should be able to do a marathon anywhere between 3:17 and 3:23. So, with the proper training, why not? 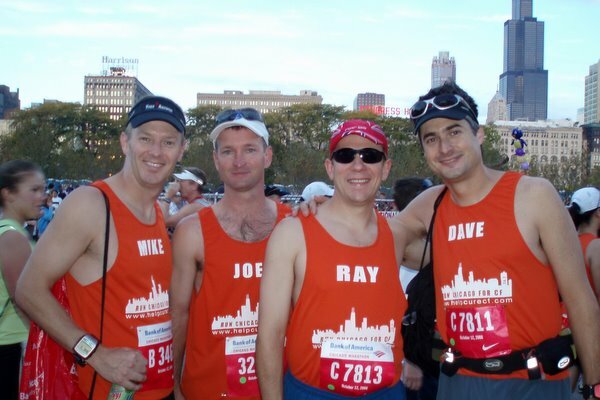 At some point in the early spring, Dave suggested running the Chicago Marathon with a couple of buddies (Ray and Joel), for the purpose of raising money and awareness for the Cystic Fibrosis Foundation, an organization dedicated to conquering the horrible disease that afflicts Joel’s kids. I had always wanted to run Chicago, I have a connection to the Chicago Marathon race committee, and this year’s race took place just two days before my 40th birthday. Perfect. So, with the race nearing capacity, Dave and I signed up, along with Anita (my wife), Sherri Converse (Anita’s sister), Suzi Kinner, Trish O’Donnell, Steve Harber, Ray, and Joel. As I discovered, training for a marathon “race” is neither easy nor all that much fun. A lot more sprints on a track and difficult runs up hills than I would prefer. To make things more difficult, my 12-week marathon plan was supposed to start the day after I finished a brutal race at the Ironman European Championship in Frankfurt, Germany. I usually try to rest for a month or two after an Ironman. But this stupid marathon plan didn’t allow it. So, Dave and I embarked on yet another training plan. And, sure enough, within a few weeks, the aches and pains that accompanied me around Italy the week after Ironman were now on Problem Street and approaching Injury Avenue. Setting aside better judgment and common sense, as Dave and I are genetically programmed to do, we trudged through. By September, the only things really bothering me were my feet. Plantar Fasciitis is a dumb ailment. But it hurts, and it takes a while to work through. Basically, the first two to three miles of each run were painful, then both feet would loosen up.